The great Fujikawa died in 1998 and since then, there's been a resurgence of interest in her work. 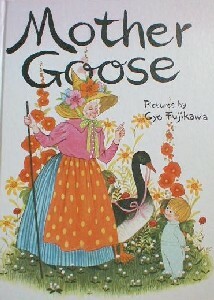 She illustrated many children's books; the most popular ones are Mother Goose, Fairy Tales, and her board books. There was a reprint of Oh, What a Busy Day in 1989, but this seems to be unavailable once again. 1, 2, 3: A Counting Book. Are You My Friend Today? Random House, 1988. Baby Animals. Price Stern Sloan, 1963. Baby Mother Goose. Random House, 1989. 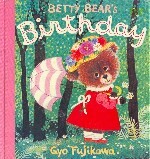 Betty Bear's Birthday. Grosset & Dunlap, 1977. *Babies. Price Stern Sloan, 1977. Babies of the Wild. Grosset & Dunlap, 1977. *Baby Animals. Grosset & Dunlap, 1963. Sterling, 2008. Can You Count? Grosset & Dunlap, 1977. *Child's Book of Poems. Grosset & Dunlap, 1969. 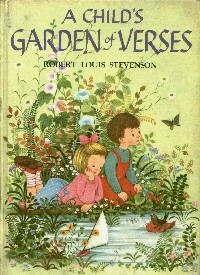 * A Child's Garden of Verses. Grosset & Dunlap, 1957. Come follow me… to the secret world of elves and fairies and gnomes and trolls. Grosset & Dunlap, 1979. Come Out and Play. Grosset & Dunlap, 1981. Dreamland. Grosset & Dunlap, 1968. 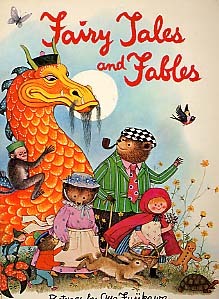 * Fairy Tales and Fables. Grosset & Dunlap, 1970. Fairyland. Grosset & Dunlap, 1981. Flyaway Kite. Grosset & Dunlap, 1981. Good Morning. Grosset & Dunlap, 1976. 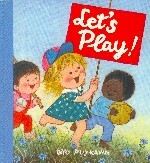 Gyo Fujikawa's A to Z Picture Book. Grosset & Dunlap, 1973. Here I Am. Grosset & Dunlap, 1981. Jenny and Jupie. Grosset & Dunlap, 1981. Jenny and Jupie to the Rescue. Grosset & Dunlap, 1982. Jenny Learns a Lesson. Grosset & Dunlap, 1981. Let's Eat. Grosset & Dunlap, 1975. Let's Grow a Garden. Grosset & Dunlap, 1978. Let's Play. Grosset & Dunlap, 1975. The Magic Show. Grosset & Dunlap, 1981. Make Believe. Grosset & Dunlap, 1957. Modern Publishing, 1996. Millie's Secret. Grosset & Dunlap, 1978. * Mother Goose. Grosset & Dunlap, 1968. My Animal Friend. Grosset & Dunlap, 1981. My Favorite Thing. Grosset & Dunlap, 1954. Night Before Christmas. Grosset & Dunlap, 1961. Oh, What a Busy Day! Grosset & Dunlap, 1976. Oh, What a Beautiful Day! Grosset & Dunlap, 1981. Our Best Friends. Grosset & Dunlap, 1973. Poems for Children. Platt &Munk, 1969. Poems for Small Friends. Random House, 1981. Puppies Pussycats and Other Friends. Grosset & Dunlap, 1975. Sam's All-Wrong Day. Grosset & Dunlap, 1982. See What I Can Be! Grosset & Dunlap, 1990. Shags Finds a Kitten. Grosset & Dunlap, 1983. Shags Has a Dream. Grosset & Dunlap, 1981. Sleepy Time. Grosset & Dunlap, 1975. Surprise Surprise. Grosset & Dunlap, 1978. * Ten Little Babies. Sterling, 2008. Welcome is a Wonderful Word. Grosset & Dunlap, 1980. Year In, Year Out. Grosset & Dunlap, 1981.